In place of overly sweet store-bought relish, Justin Chapple grills dill pickles, then combines them with onion, vinegar, mustard seeds and parsley for a smoky, well-balanced relish with delightful pops of mustard seed. Light a grill or preheat a grill pan. Grill the pickle slices over high heat, turning once, until lightly charred on both sides, 3 to 5 minutes. Transfer to a work surface to cool, then finely chop. In a medium saucepan, heat the oil. Add the onion and a generous pinch of salt. Cook over moderate heat, stirring occasionally, until softened, 5 minutes. Add the vinegar, sugar and mustard seeds and simmer for 5 minutes. Remove from the heat and stir in the pickles; let cool completely. Fold in the parsley and season with salt. Relight your grill or heat the grill pan. Grill the hot dogs over moderate heat, turning occasionally, until cooked through, about 5 minutes. 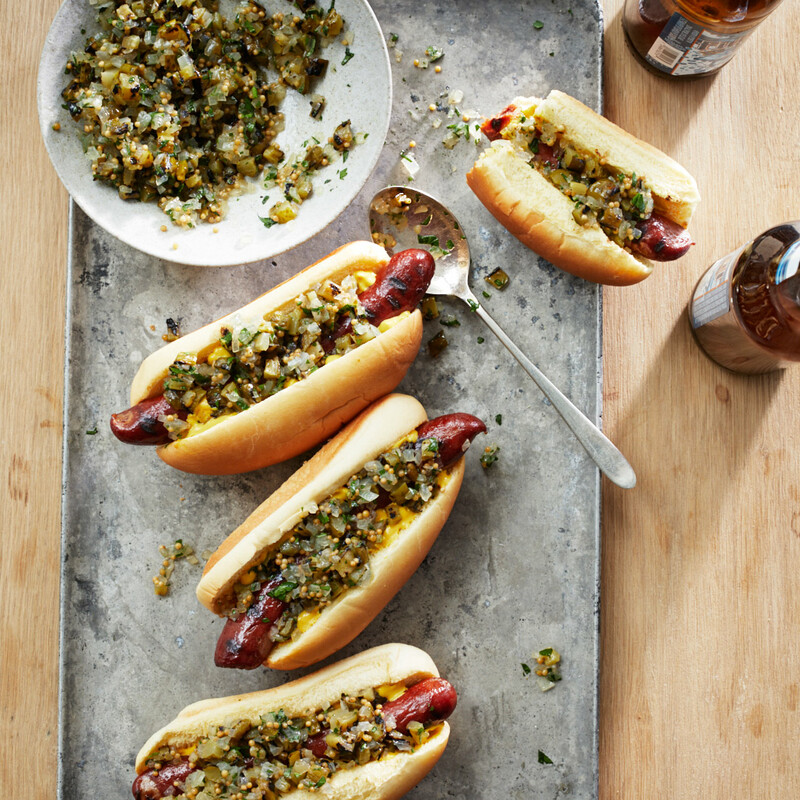 Serve the hot dogs in the buns with the relish. Review Body: I use 6 kosher dill sandwich slabs grilled and really cooled. Love this unique taste. Review Body: I am not a pickle fan.